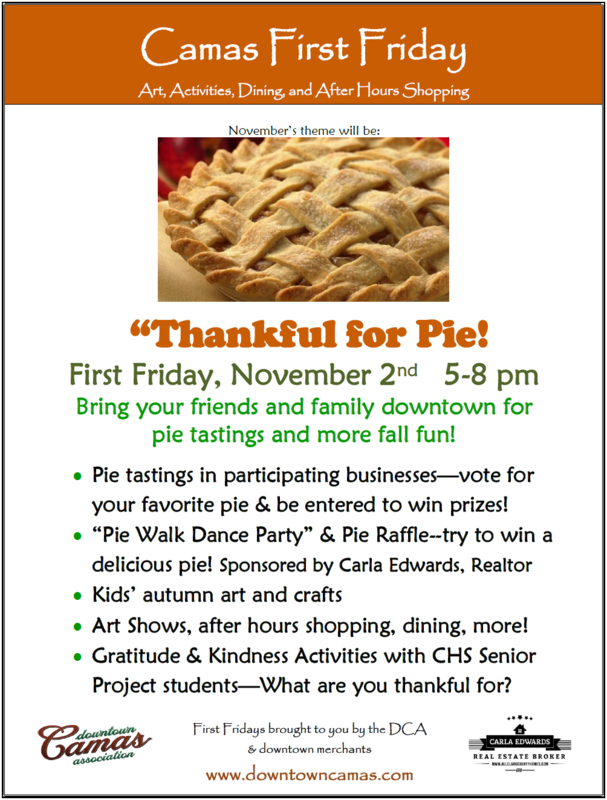 Oh we have fun things planned for Downtown Camas First Friday in November!! 5-8pm. The theme is “Thankful for Pie!” and we will be doing pie tastings in participating merchants!! Stop by the DCA tables at Journey Community Church​ at 4th and Birch for your pie passport and activity list. Yum!! Pie Tastings in participating businesses–vote for your favorite pie and be entered to win prizes from the merchants or pies! Pie Walk Dance Parties starting at 7pm in Journey Church, 304 NE 4th — win a delicious pie or other yummies and have fun dancing! Thank you Truly Scrumptiousand Cake Happy for donating some of the pies! Pie Raffle! at the DCA tables in Journey Church sponsored by Carla Edwards with allclarkcountyhomes.com – Thank you Carla for this and the pie walk dance party! CHS Seniors community kindness project and coffee sales! Pick up your participation and activity list for the evening at the DCA tables in Journey starting at 5pm. Holiday shopping will be gearing up in a big way and all the restaurants will have warm, comforting fall food 0ptions. Downtown will be beautiful with all the fall leaves and it will be the perfect night to bundle up and share some time in your community. Enjoy it all! Sponsored by the DCA, the downtown merchants, and Carla Edwards, Realtor.